Use conditional access policy for Skype for Business Online to manage access to Skype for Business Online, based on conditions you specify. The information in this topic applies to System Center 2012 R2 Configuration Manager or later. Enable modern authentication for Skype for Business Online. Fill this connect form to be enrolled in the modern authentication program. All your end-users must be using Skype for Business Online. If you have a deployment with both Skype for Business Online and Skype for Business on-premises, conditional access policy will not be applied to end-users. Be an Android or iOS device. Be compliant with any deployed Intune compliance policies. If the device is not enrolled with Intune, or is not registered in Azure Active Directory, a message is displayed with instructions about how to install the company portal app and enroll. If the device is not compliant, a message is displayed that directs the user to the Intune Company Portal website or Company Portal app where they can find information about the problem, and how to remediate it. Before you start, configure Azure Active Directory security groups for the conditional access policy. You can configure these groups in the Office 365 admin center. These groups contain the users that will be targeted, or exempt from the policy. When a user is targeted by a policy, each device they use must be compliant in order to access resources. Exempted groups – Contains groups of users that are exempt from the policy (optional) If a user is in both groups, they will be exempt from the policy. Ensure that you create and deploy a compliance policy to all devices that the Skype for Business Online policy will be targeted to. For details about how to configure the compliance policy, see Compliance Policies in Configuration Manager. If you have not deployed a compliance policy and then enable the Skype for Business Online policy, all targeted devices will be allowed access if they are enrolled in Intune. When you are ready, continue to Step 3. Next, configure the policy to require that only managed and compliant devices can access Skype for Business Online. This policy will be will be stored in Azure Active Directory. 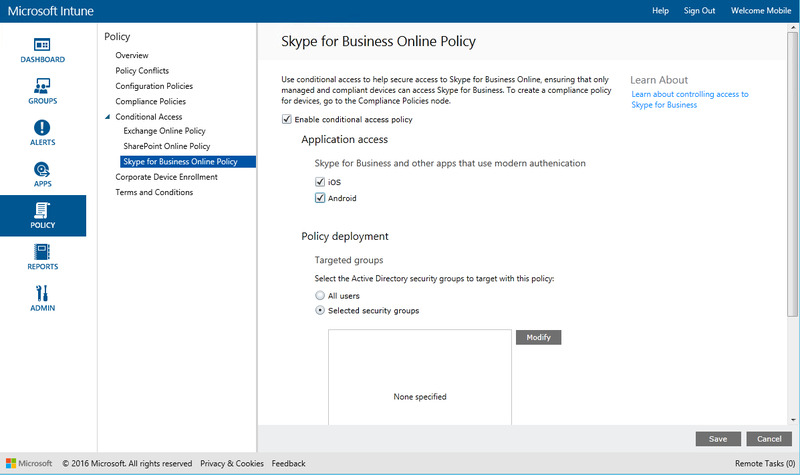 In the Microsoft Intune administration console, click Policy > Conditional Access > Skype for Business Online Policy. Select Enable conditional access policy. Under Targeted Groups, click Modify to select the Azure Active Directory security groups to which the policy will apply. You can choose to target this to all users or just a select group of users. You have now configured conditional access for Skype for Business Online. You do not have to deploy the conditional access policy, it takes effect immediately. In the Groups workspace, you can view the conditional access status of your devices. Devices that are not registered with AAD – These devices are blocked from Skype for Business Online. Devices that are not compliant – These devices are blocked from Skype for Business Online. Devices that are registered with AAD and compliant – These devices can access Skype for Business Online.